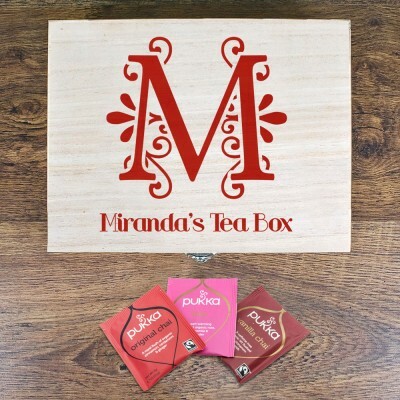 A special edition of our wooden tea box perfect for any Occasion. Made from pine and personalised with an initial, name and personal message on inside of lid. Each box is filled with a selection of heart warming Pukka tea. A gift for those who love their tea! Lover's Tea Vanilla Chai - A caffeine-free cup of fairly-traded sweet organic vanilla tingling with cinnamon and ginger Love - An intoxicating and warming mix of rose lavender and chamomile Original Chai - A soothing mix of gingery warmth cinnamon glow cardamom zing and a black tea lift dappled with licorice.